Frederic Kirkland Powell, III, publisher of the Pleasant Hill Times from 1989 to 2015, passed away Tuesday, April 3, 2018, after a cardiac attack caused him to have a car accident in downtown Pleasant Hill. He was 74. Powell was born October 23, 1943, in Schenectady, New York, the son of Frederic Kirkland and Barbara Ann (Griffith) Powell, II. He was a 1961 Harrisonville High School graduate and he earned his Bachelor’s Degree in Journalism from the University of Missouri at Columbia in 1966. On January 21, 1965, he married Jan S. Heusi in Columbia, Missouri. She preceded him in death on July 29, 2015. Powell also was preceded in death by his parents. Powell is survived by two daughters, Stacey (and Jon) Soble of San Luis Obispo, California, and Victoria (and Pete) Johnson of Santa Rita, Guam; four grandchildren, Rachel Soble, Charlie Soble, Michael Ryan Johnson, and Matthew Johnson; other relatives and friends. Following their marriage, Kirk and Jan Powell lived in Rochester, New York, where he worked for the Rochester Times-Union. They returned to Missouri in 1968, when Powell accepted the position of news editor at the Cass County Democrat-Missourian in Harrisonville, Missouri. In 1975, the Powell family moved to Holden, Missouri, when Kirk and Jan purchased The Holden Progress in Holden, Missouri. In 1989, they purchased the Pleasant Hill Times, managing both newspapers for two years until they sold The Holden Progress to devote all their energy to The Times. At this time, the Powells moved permanently to Pleasant Hill, Missouri. After purchasing two Apple computers and a laserwriter in the mid-1980s, Powell helped pioneer the use of desktop publishing in the production of a weekly newspaper. He shared their experience with the new technology with many of their newspaper colleagues. Powell also was a syndicated columnist and political cartoonist. 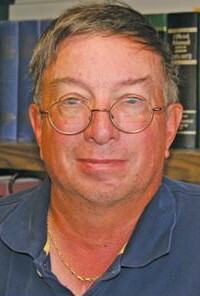 Powell served as president of the Central Missouri Press Association from 1980-81, president of the Missouri Association of Newspaper Editors from 1995-96 and president of the Missouri Press Association in 1994. He also served on the Missouri Press Foundation’s Board of Directors and the Missouri Press Association’s nominating committee. In 2004, he was inducted into the Missouri Newspaper Hall of Fame. Powell also served on the Pleasant Hill Community Betterment Board, the Pleasant Hill Downtown Association, the Pleasant Hill Planning and Zoning Commission, the Pleasant Hill Community United Way and the Optimist Club in Pleasant Hill and Holden. He is a past president of the Pleasant Hill Chamber of Commerce, past president of the Pleasant Hill Optimist Club and past chairman of the Pleasant Hill Planning and Zoning Commission. In 2013, Kirk and Jan Powell were the Grand Marshals of the Cass County Fair. In his spare time, Powell enjoyed sailing his boat on Lake Jacomo and traveling to Europe or the Caribbean with Jan and friends. He was an enthusiastic historian and a former Civil War re-enactor. He also enjoyed bantering at Coffee Club, telling a good joke and debating politics. His dry sense of humor will be missed by all who knew him. Visitation was held Friday, April 13, 2018, at Stanley Dickey Funeral Home in Pleasant Hill. Funeral service was held Saturday, April 14, 2018, at St. Peter’s Episcopal Church in Harrisonville. Reverend Avelino Baguyos officiated. Inurnment followed in the church’s columbarium. Memorial contributions are suggested to the Missouri Press Foundation Scholarship Fund and may be sent in care of the funeral home or at mopress.com.